Wanting a recommendation for a really good, formal, meal whilst in Cádiz (Mrs. SF and I love to graze on tapas or pintxos, but also tend to like to have at least one proper sit down meal in whatever city we are visiting in Spain), I enlisted the help of Rocio Ruiz from the fabulous Bodegas Mons Urium (who with her father and husband had fabulously feed, watered/sherried and entertained Mrs. SF and I during a truly memorable afternoon in Jerez last year). 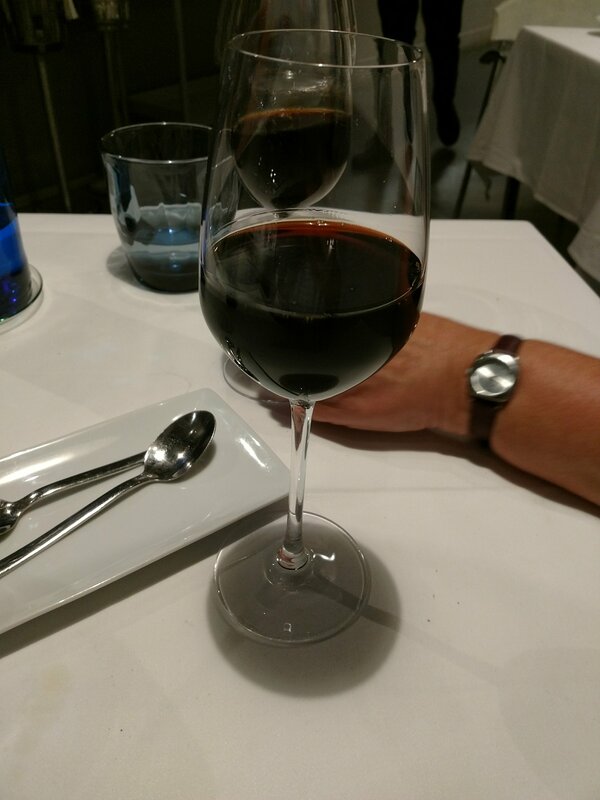 My logic was that one of the people behind probably my favourite sherries (and readers will know I truly love good sherry) would have the lowdown on a good place for a slap up meal in Cádiz. 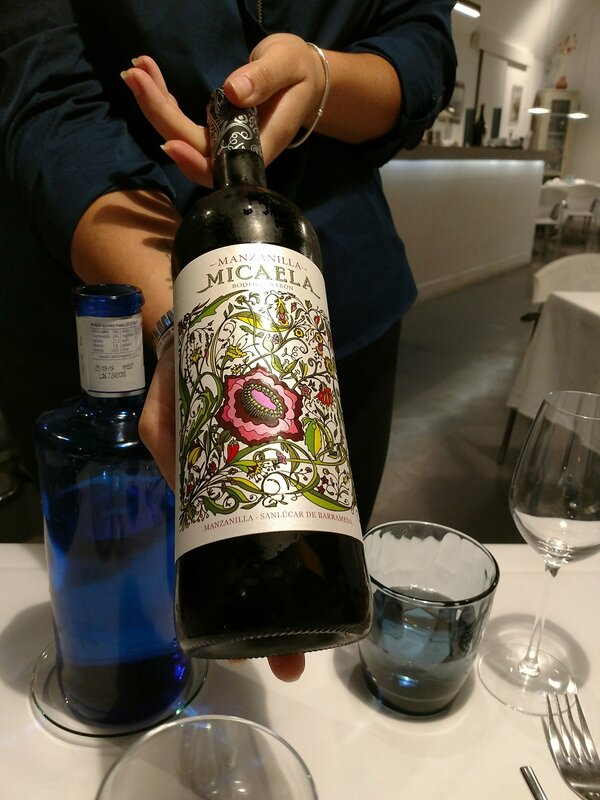 Rocio’s recommendation was Código de Barra (with one of their dishes showcasing Urium’s glorious palo cortado and their list featuring lots of Urium wines) and on looking at their Instagram feed I felt we were on to a winner. Really interesting menu items on their Facebook page and a seeming bargain price of €30 (add €12 for wine pairings with it – yes you read that correctly as €12) for their 7 course degustation menu very much sealed the deal in my eyes. Loving a bargain and trusting in Rocio, I booked a table for as early in the evening as is possible in Southern Spain (20.30), where they eat ridiculously late. It was pretty empty on our arrival, it having only just opened, but was buzzing when we left at well past 23.00 (people were coming in to eat as we left). I once finished a 15 + course degustation menu in the wonderful El Portal in Ezscary, La Rioja at 01.30 in the morning (having booked the table for 21.30). It was an epic meal, but 01.30 is well past my bed time let alone the time to be tackling petit fours and coffee after stuffing my face with exquisite food and fabulous wines. Getting back on track, Mrs. SF and I rolled up to Código de Barra with high hopes. 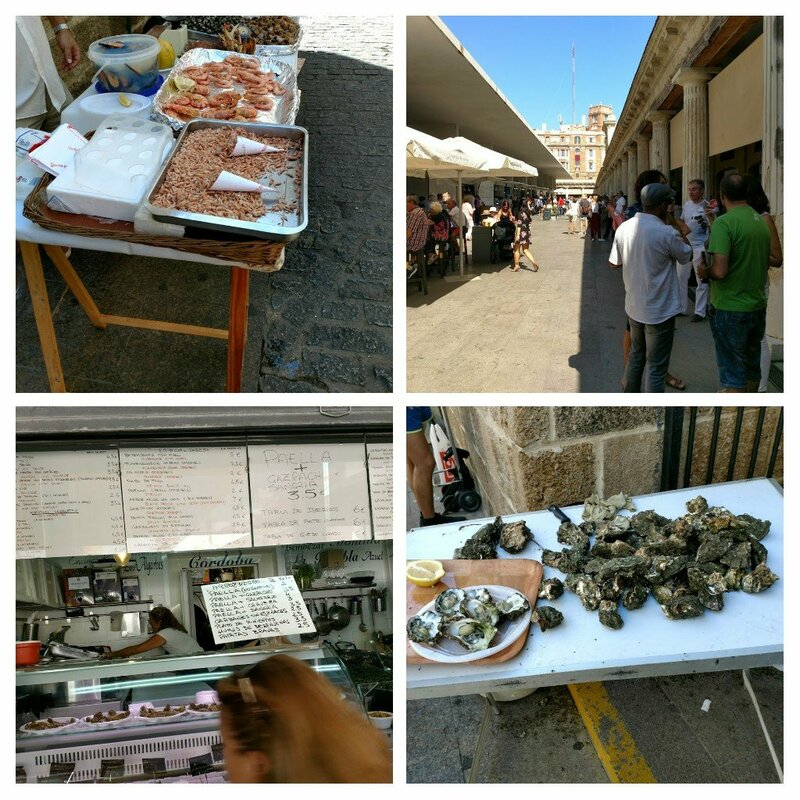 The restaurant is located in a pretty little plaza in the old town part of Cádiz and has a very unassuming exterior (easy to miss, with us walking all around the plaza before we finally clocked it). We opted for a table inside with the view of the kitchen. Inside it is pretty tiny with the feel of a bar come restaurant rather than a Michelin star style palace. 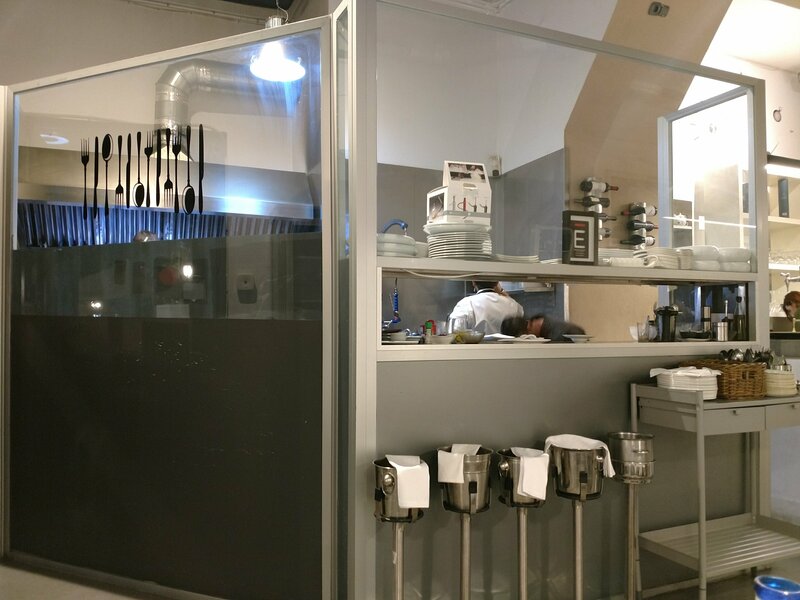 The kitchen itself is miniscule, with 3 chefs having to piroutte around each other as they alternated between the cooking and applying finishing touches at the pass. They worked like trojans all night and it was fascinating to watch their dance. Incredible attention to detail and an amazing level of coordination. The ability to watch the chefs at work in their miniscule kitchen added a lovely bit of theatre to the evening. They operate an al a carte menu and also, at weekends (with a reservation), a degustation menu. 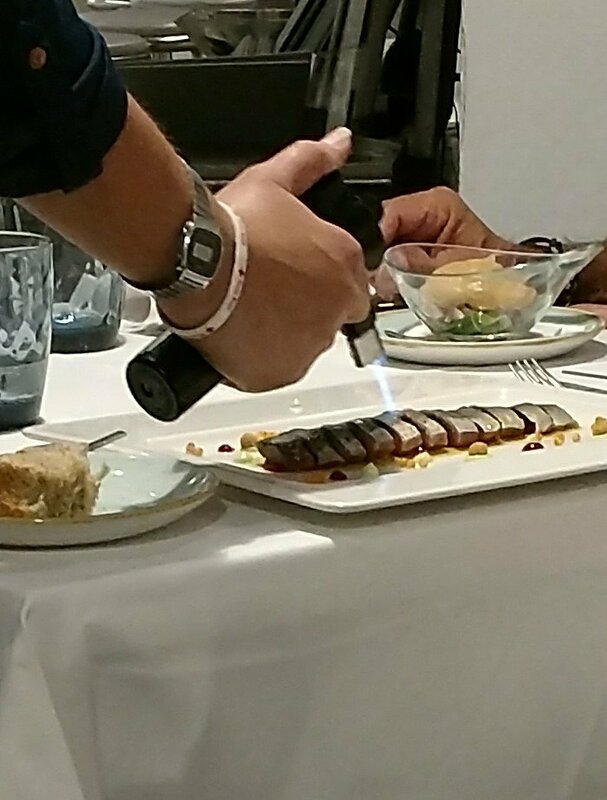 I was particularly intrigued by the mackerel dish presented to the next table, with the cooking limited to a quick blow torching of the fish at the table. Fab looking dish that did give me a bit of food envy and a look from Mrs. SF as I craned my neck to try and get a better shot of it. 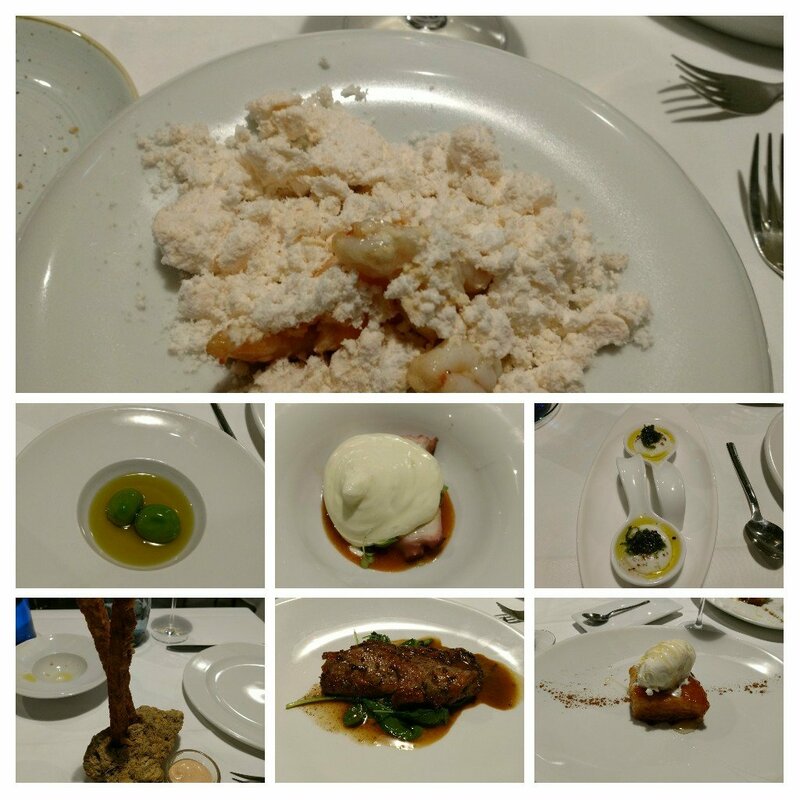 We, however, were there for the degustation menu (here called the Menu Clásico) which seemed to allow you to try what looked like a lot of the best bits on the menu (though regrettably not the mackerel). 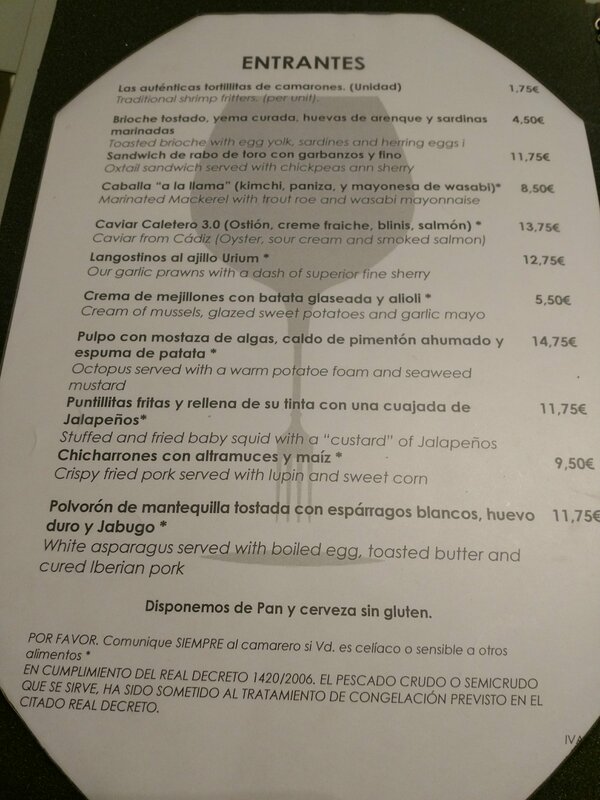 One point to note here is the Menu Clásico is only served at the weekend and you (in theory) have to request it in advance (i.e. when you book). Whilst I had booked I had neglected to stipulate I wanted the Menu Clásico. We asked if it was ok to order it and after a worryingly long debate between the kitchen staff and front of house we got the thumbs up. 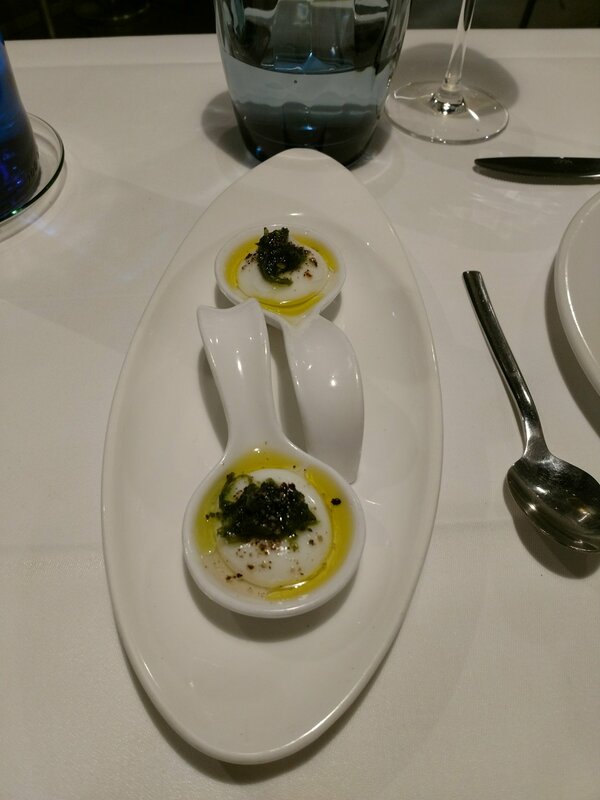 First up was a yogurt and seaweed amuse bouche. The pepperiness and crunch of the seaweed worked really well as a counterpoint to the smooth and slightly sour yogurt. It was all bathed in some absolutely stunning olive oil that added to the pepperiness of the seaweed. 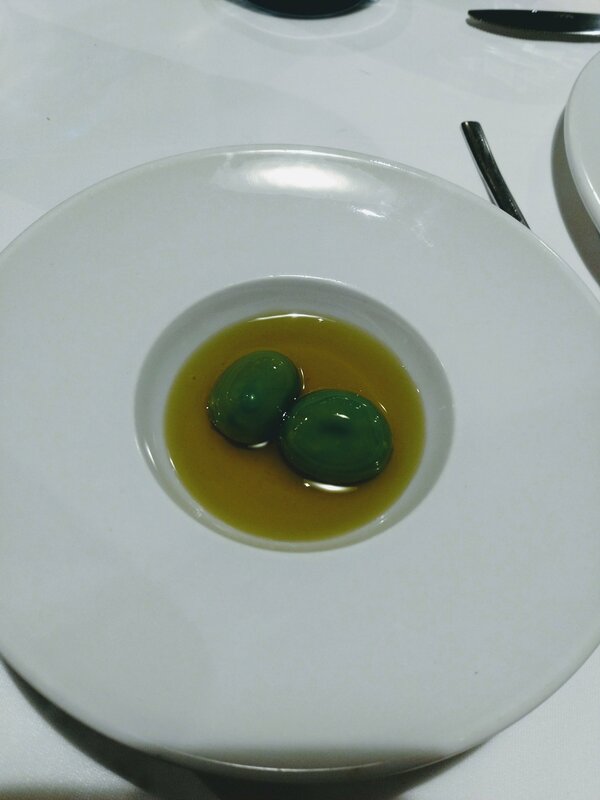 The second assume bouche was an intriguing little number, looking like a couple of olives in a pool of olive oil (a darker more grassy number than the one with the seaweed). We were instructed to pop the each one in our mouths whole, whereupon they dissolved on the tongue almost instantaneously releasing classic olive flavours. 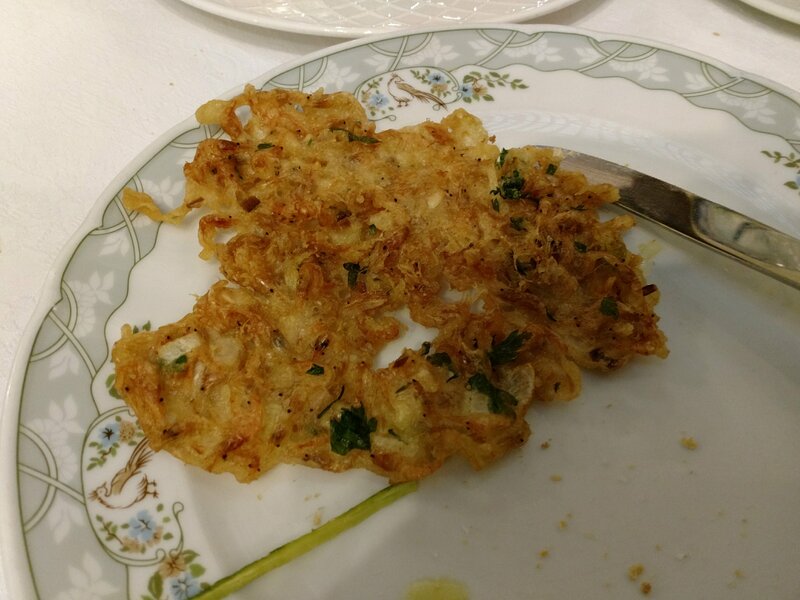 Next up was this place’s take on the Cádiz classic, tortilla de camorones (shrimp pancakes/fritters). 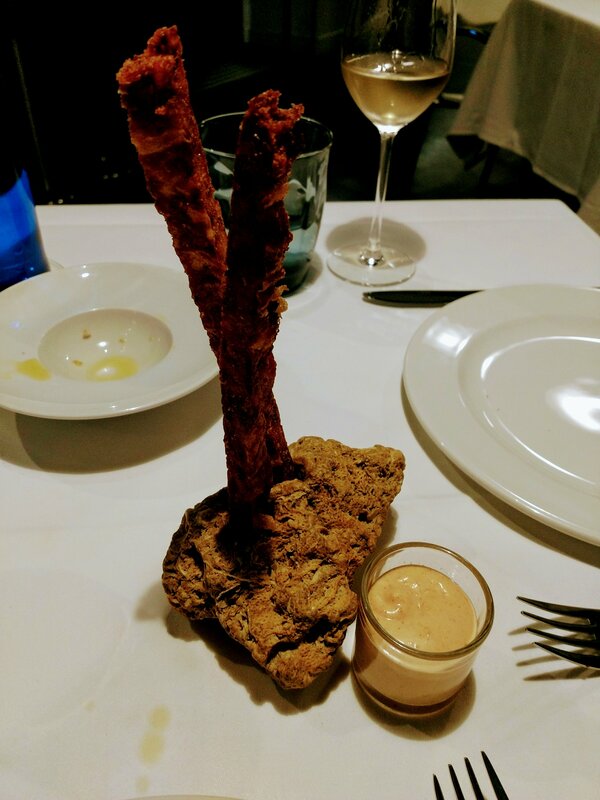 and instead delivered it in a stick shape. The worry I had with this was that it would result in a loss of the lightness found in a good tortilla de camerones (where there should be a high ratio of tiny shrimp to batter). This was unfounded as what we got was crisp, wonderfully light and packed full of prawney loveliness. The accompanying dipping sauce (a superior take on thousand island dressing with a punch of hot paprika in there) went beautifully with this dish. 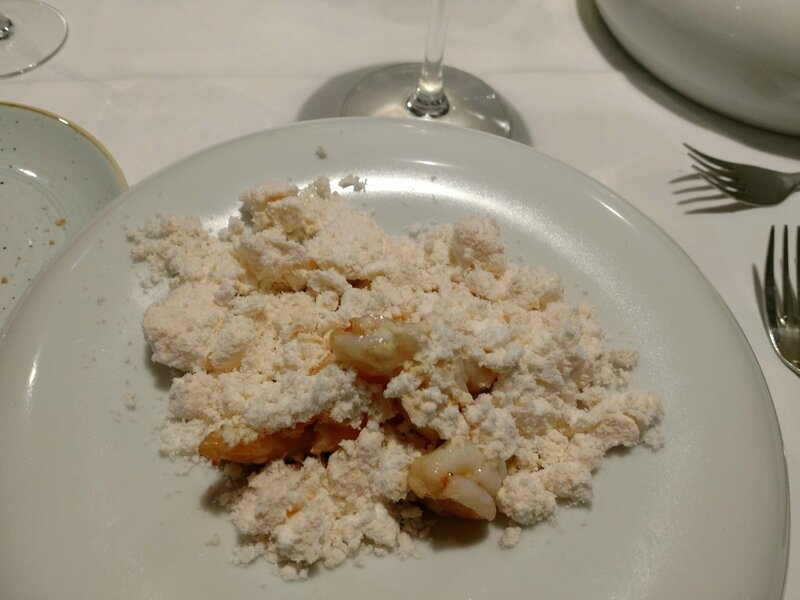 The first of the most substantial dishes was a riff on gambas ajillo, with the garlic element dehydrated to a powder form which dissolved on contact with the tongue. Sort of like a garlic sherbet. Very interesting (in a good way) both texturally and on the palate. The prawns themselves were perfectly cooked (just past the point of translucency) and bathed in a sauce based (so Rocio tells me ) on Bodegas Mons Urium’s stunning fino. This brought a gorgeous nuttiness to proceeding and made for an absolutely brilliant dish. Pulpo (octopus) was next up, coming with a potato foam and seaweed mustard. Sweet octopus, that was butter knife tender was bathed in a briney seaweed mustard sauce. 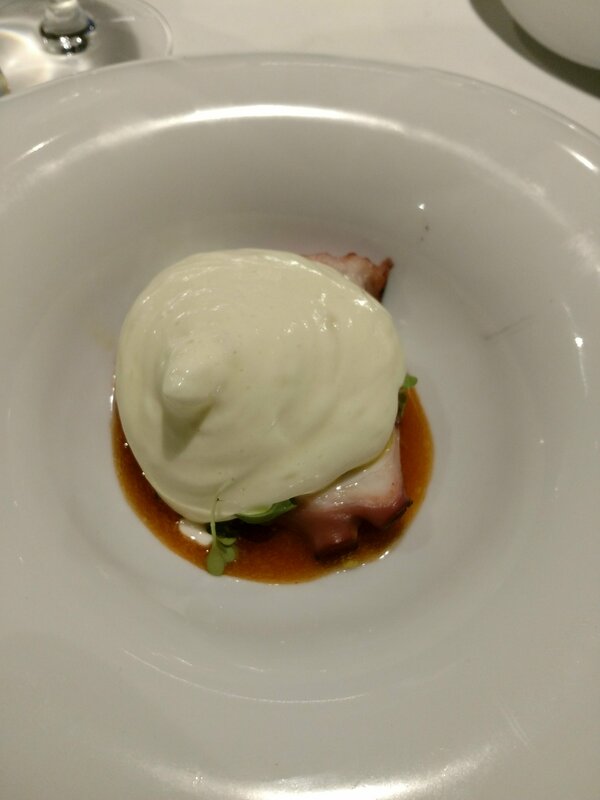 Added to this was a smooth and airy (as well as properly seasoned) potato foam (actually a very light aerated puree). A very nice dish this, but perhaps a little lacking in the wow factor as against the previous gambas ajillo number. 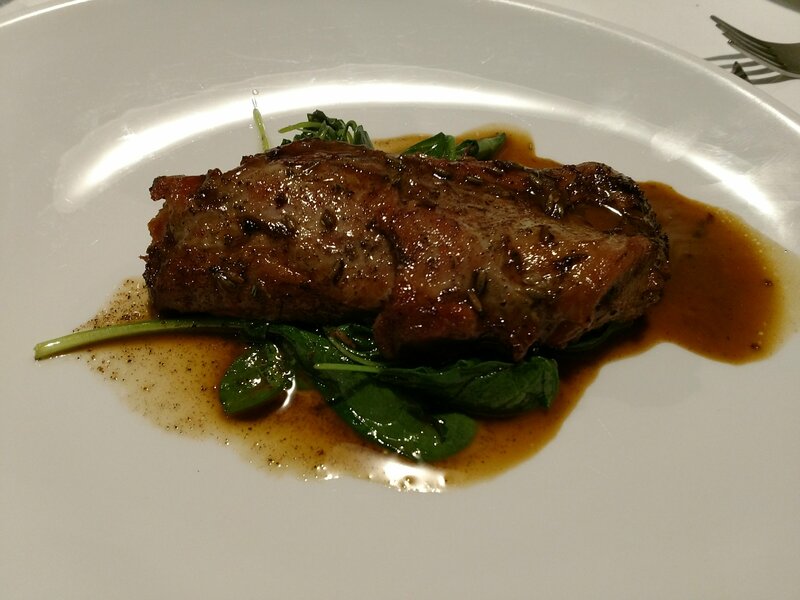 The final savoury course was a stunning piece of roasted lamb (shoulder I believe), with a lavender infused jus and spinach. They achieved the holy grail in lamb shoulder terms of a crispy exterior and a cut with a spoon tender interior. Great flavour to the lamb, with an intense lamb jus with just enough lavender to make its presence felt (any more and it would have overpowered). The spinach added a nice touch of iron rich greenage (veggies are often a bit lacking on Spanish menus). 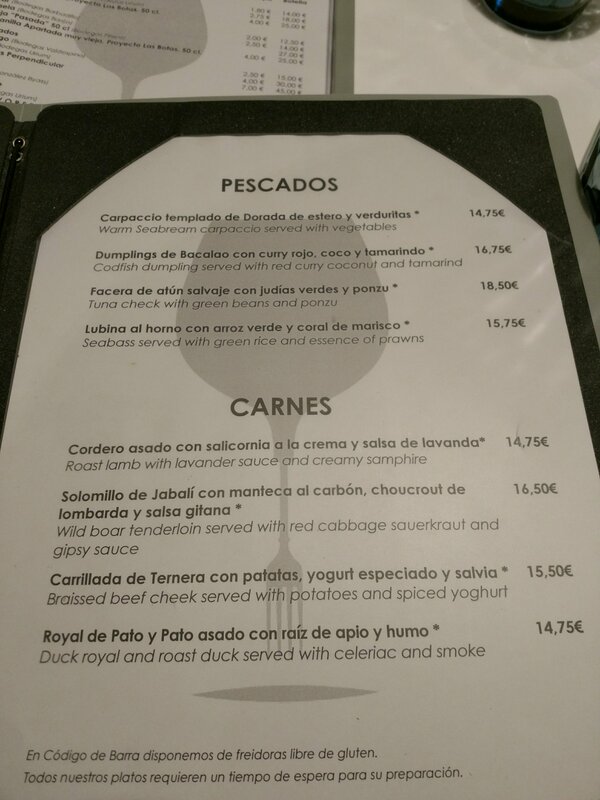 We were told at the start that they did not have ay of the goats cheese that night (as result I fear on our cocking up re booking and not stipulating the Menu Clásico at the time of booking) , which was a shame as I think it would have worked a treat with the lamb. 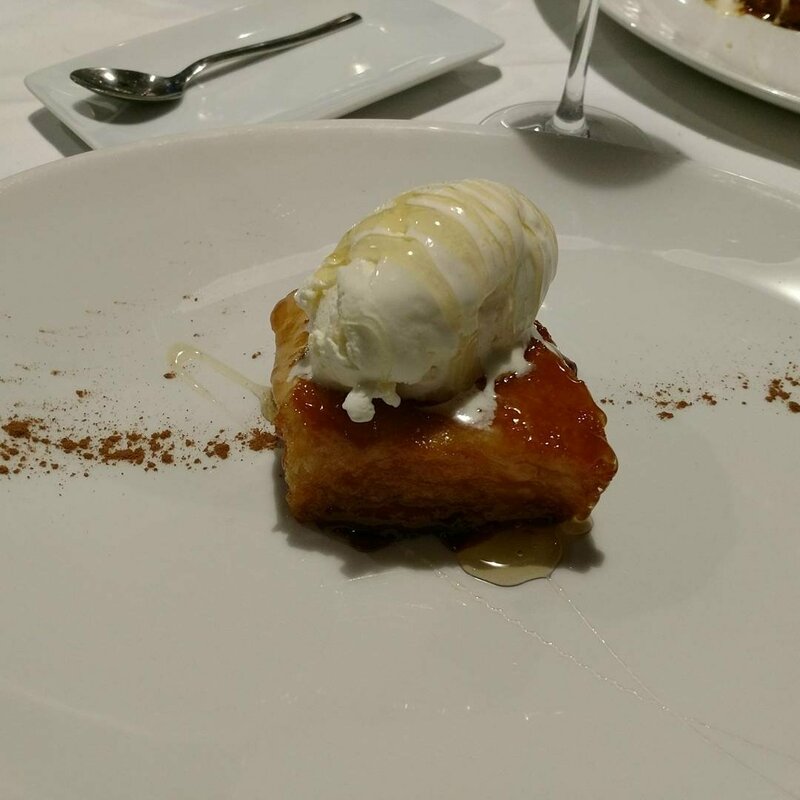 The final course was a superlative example of that Spanish classic dessert, torrija de nata. As light as a feather price of French toast was lacquered with an intensely, nut studded, caramel and topped off with a very classy vanilla ice-cream. 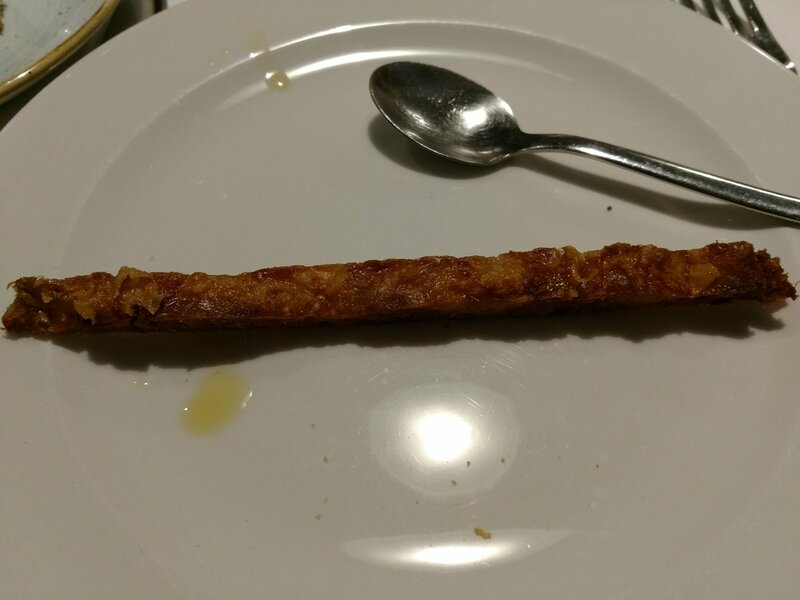 I have eaten a lot of torrija in Spain and this was the best I have tasted to date. including lots from my favourite sherry producers Bodegas Urium (fabulous stuff) and a good geographical spread across the wonderous wine country that is Spain. The wine on the list are pretty keenly priced, with for example a Sierra Cantabria Selección at a mere €13.75 on the list (it is £11.25 retail in the UK, so expect to pay £30 plus in a restaurant over here ). 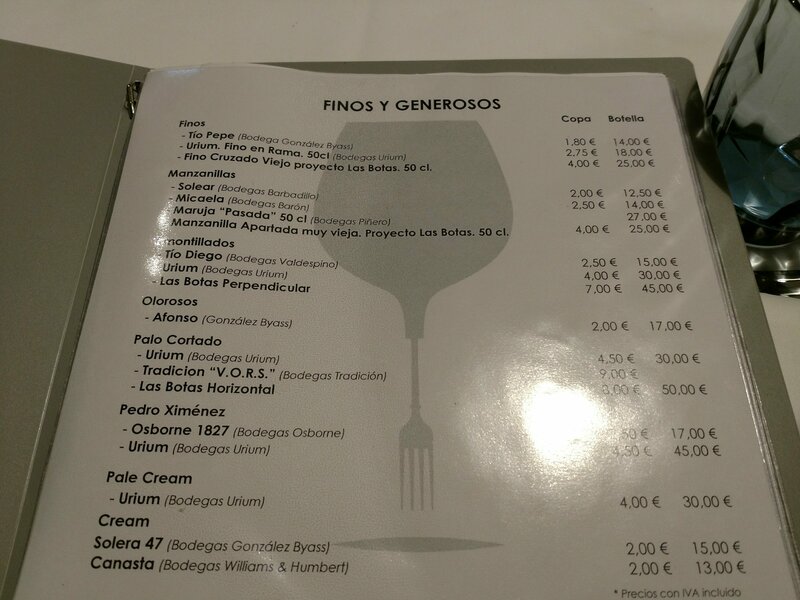 I love the way even the best restaurants in Spain price wine. No gouging, with wine drinkers not expected to subsidise everyone else as is often the case in the UK, just utter fairness. 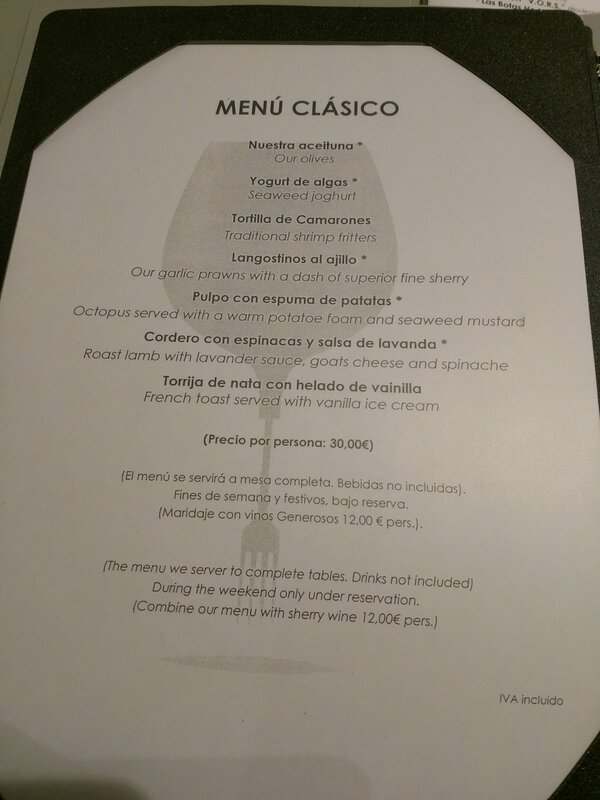 We decided on the pairing on offer with the Menu Clásico, which at €12 a head seemed a hell of a bargain. Classic notes of almond, herbs and camonile on the nose and fresh apples, olive, almonds and a nice salinity on the palate. Super with the yogurt and seaweed, olive creation and their take on tortilla de camarones. 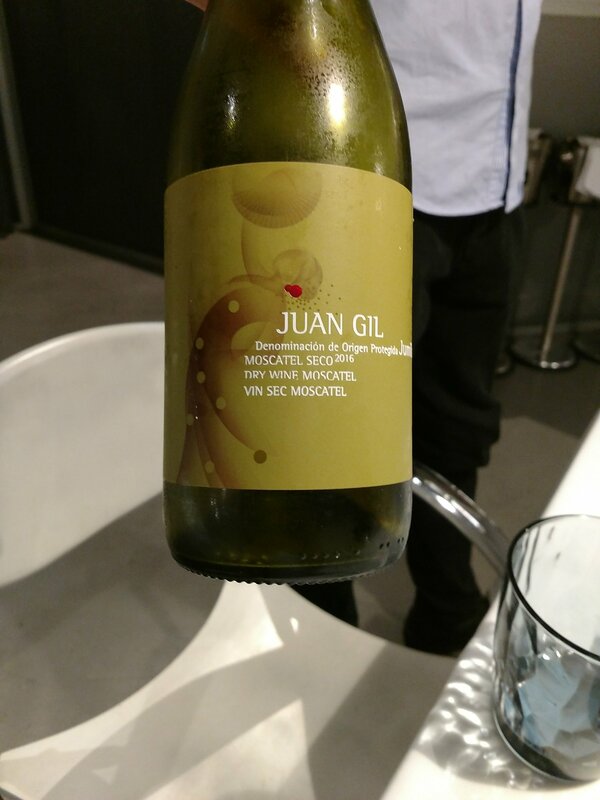 Next up was a rather fine dry moscatel/muscat from Juan Gil from the D.O. Jumilla in Murcia). Peaches, lychees and a touch of gooseberry on the nose (not classic muscat) and dry with grape (more classic muscat) and citrus fruits on the palate. A great seafood wine that paired very well with the gambas ajillo and pulpo (octopus) dishes. With the lamb we had a local Tierra de Cadiz wine in the form of a Garum from Bodegas Luis Perez. Made from a blend of merlot (60%), syrah (30% and petit verdot (10%), this had some lovely notes of spice, red fruits, liquorice and a touch of cocoa on the nose and bags of red fruit and a hint of roasted coffee beans on the palate. Very drinkable wine this (I bought a bottle back, amongst others, to the UK in my beloved VinGardeValise) and rather lovely with the lamb. 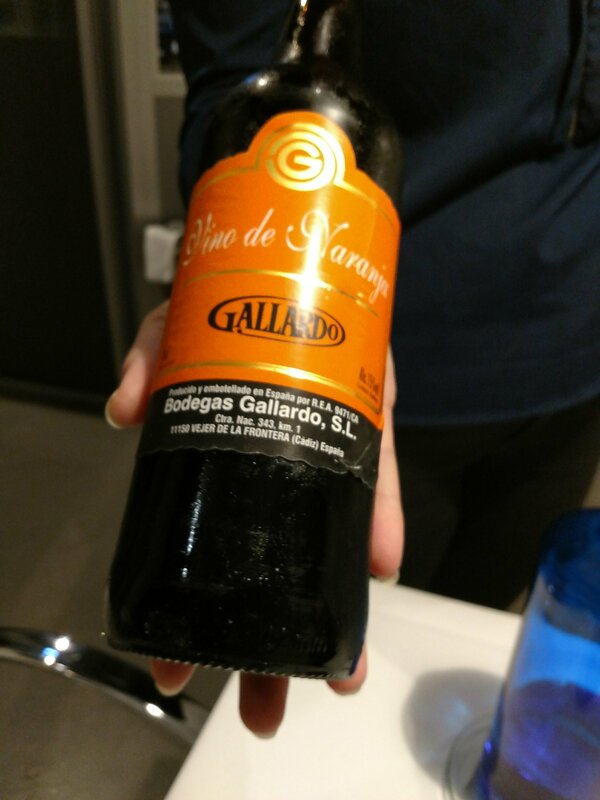 The final wine with the dessert was an interesting number from Bodegas Gallardo. A first for me in the form of a vino de naranja, being a pedro ximenez based wine which has dried sour orange peel added to it and is then left to steep for 8 years. The result is an almost black wine (as per a PX), with very intense orange aromas and taste. Sweet, yet very refreshing. 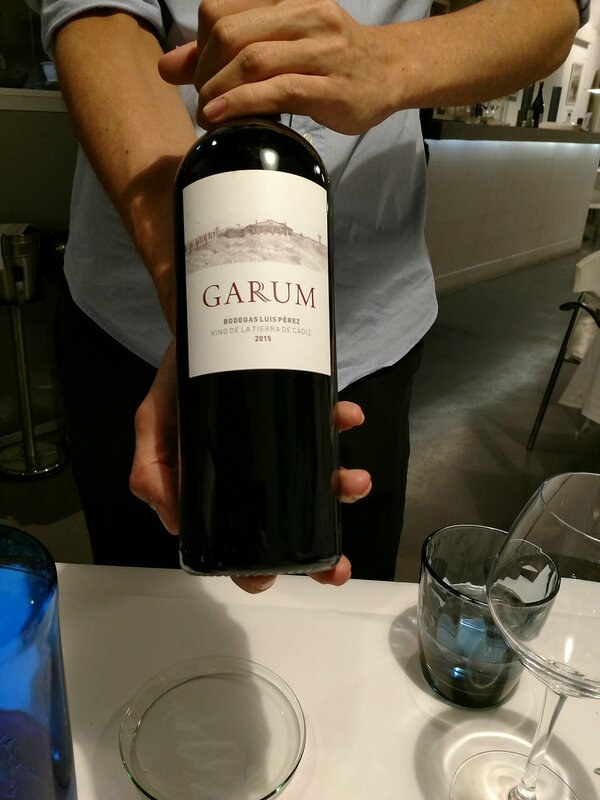 An interesting wine that worked very well with the torrija de nata dessert (would be great with chocolate based desserts also I think). The food here is top class and fabulous value. 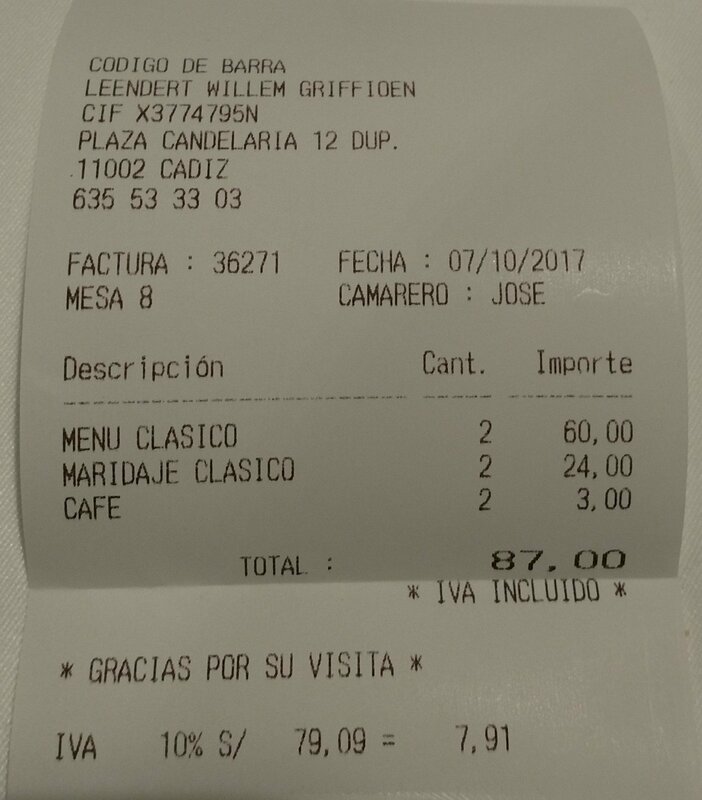 Two Menu Clásico, with wine, mineral water and coffee came (sans a tip) to a mere €87 (under £80 on the basis of the current rubbish exchange rate). Extraordinarily good food bearing in mind the miniscule sized kitchen. Would I go back? Hell yes. Probably the best value meal I have had this year (and for sometime before that). 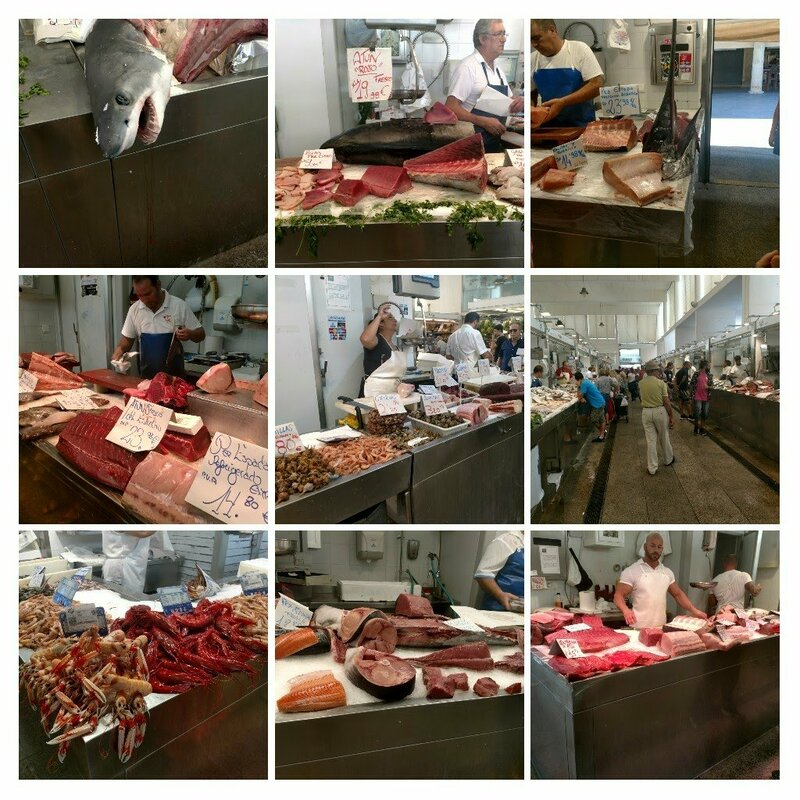 This is a must visit place if you are in Cádiz (Rick Stein – you missed a pearler when you came here for one of your long weekend) in my humble opinion. 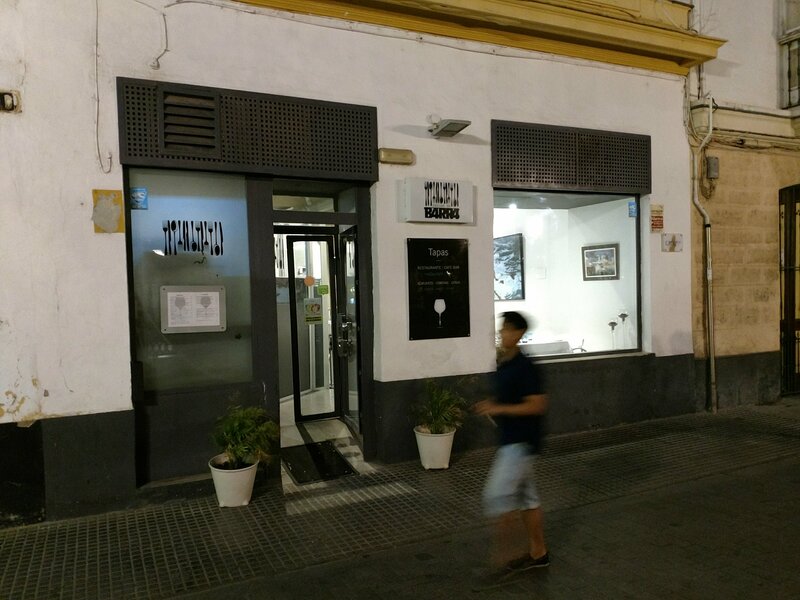 Address: Plaza de Candelaria, 12 Duplicado, Cádiz 11002. 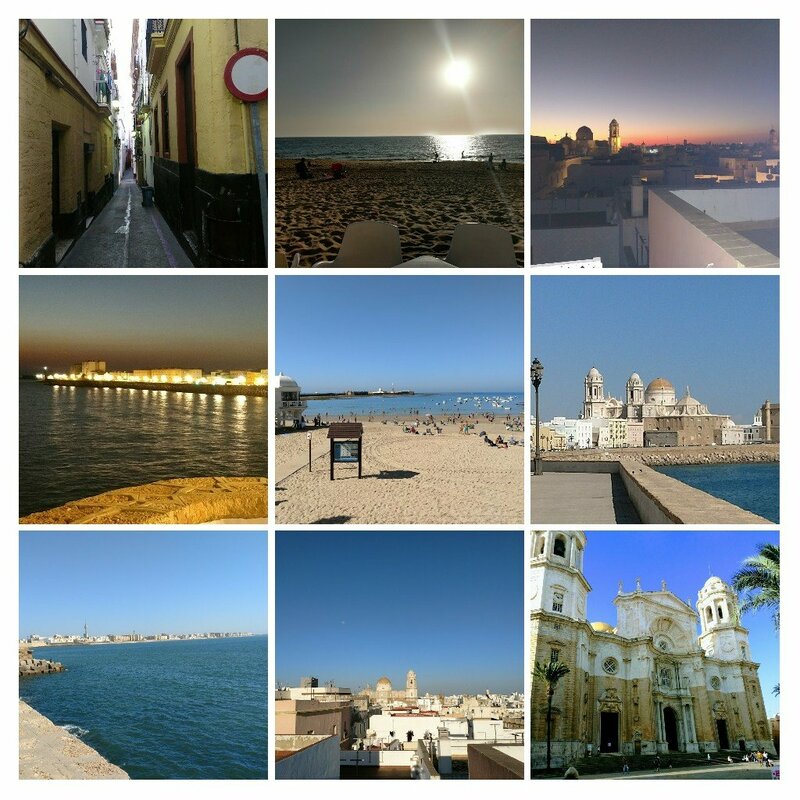 Cádiz is a beautiful and interesting city (well worth a visit – lots of history, beaches and, of course, food). We stayed in the old town at an apartment called Apartmente El Torre el Mirador. Fab location and apartment, where I enjoyed many a rebujito on the roof terrace. 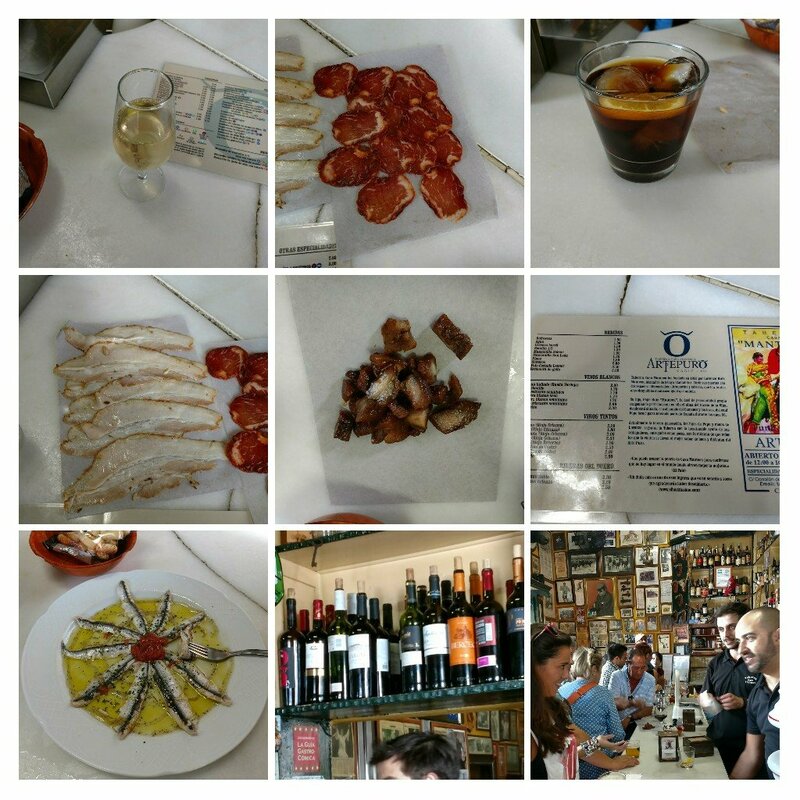 Casa Manteca – classico Cádiz bar with super booze (very cheap sherries and a great vermouth) and food offering. You have to have the chicharrones (both types), but they also do cracking seafood. Very hectic (certainly on our Saturday lunchtime visit), with having at least a smidgen of Spanish very useful in getting served. 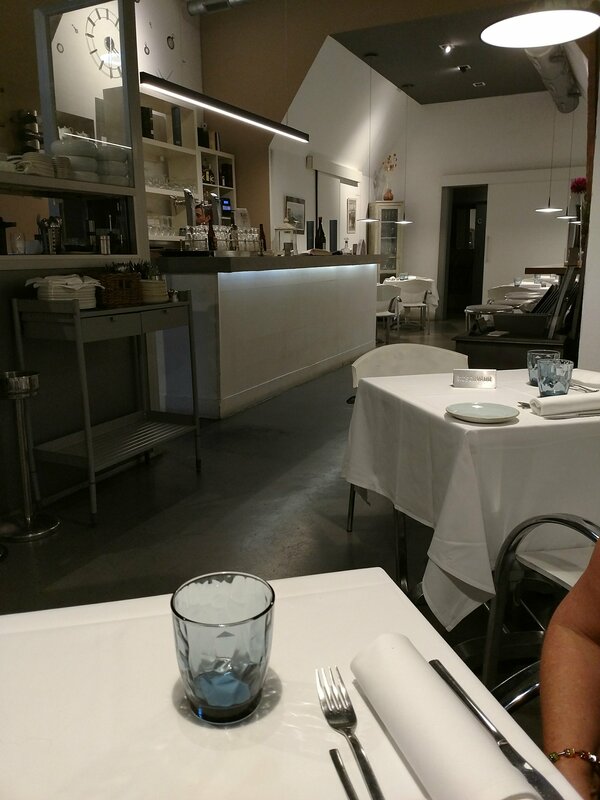 El Faro de Cadiz – fabulous tapas bar and behind it a classy restaurant that does some lovely traditional Cádiz dishes like arroz caldoso, pescadito fritos and tortilla de camerones. 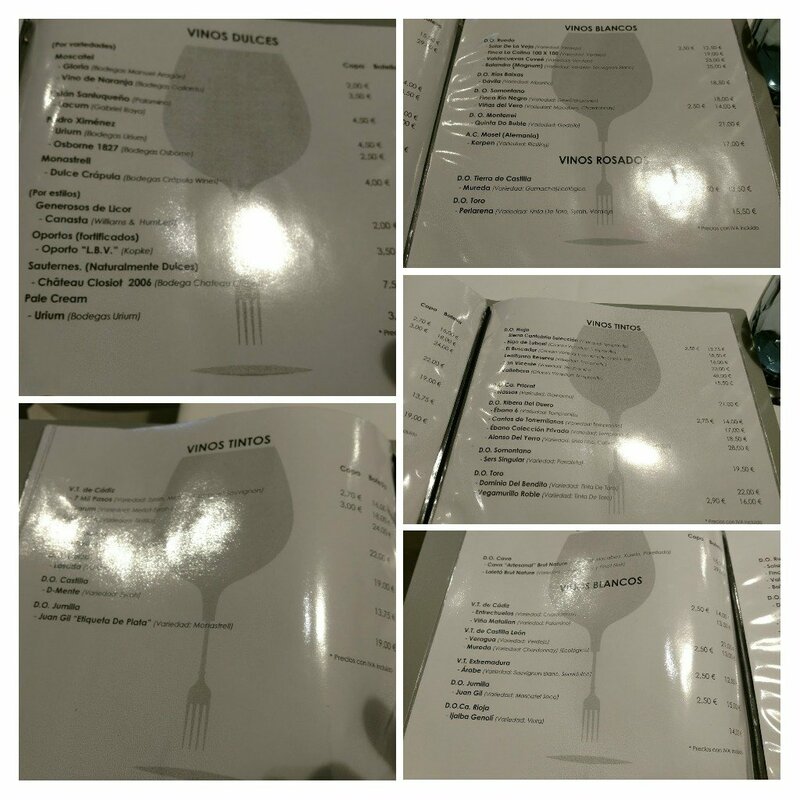 Great for fish of all varieties Nice wines list (very reasonably priced) too. 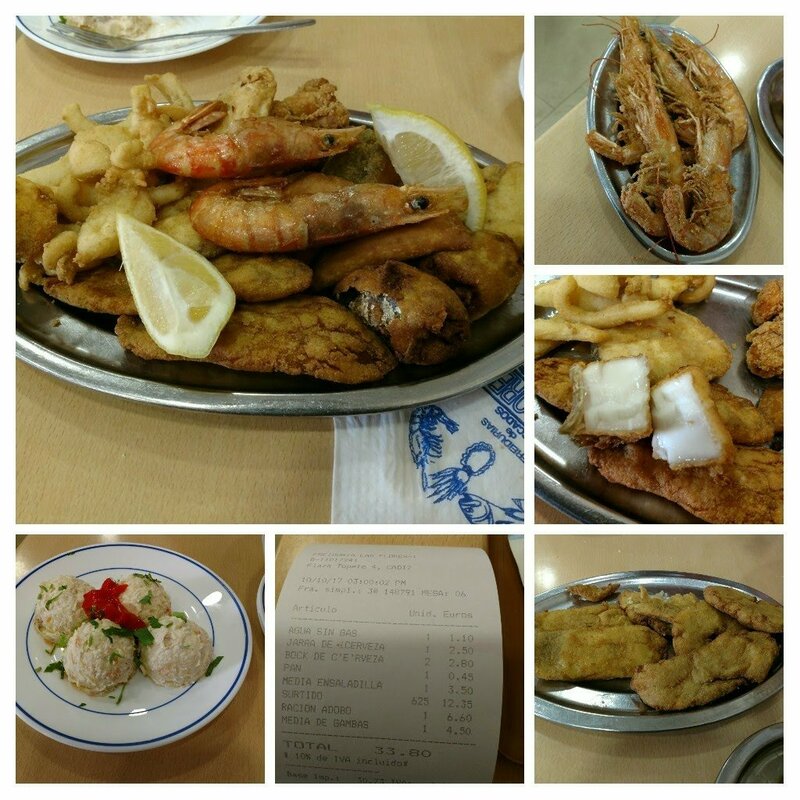 Frieduras de Flores – Superb, plentiful fried fish is the order of the day here. Great with an ice cold beer, crisp dry white wine or better still a manzanilla or fino and as cheap as chips (which you don’t get with your fried fish here). Always busy, but worth the wait (don’t just plonk yourself on what appears to be a free table, as there is a strict allocation system, so get your name on the list and then sojourn to the bar for a beer, manzanilla etc. until your name is called). They also do take outs. and places selling meat, charcuterie, cheese etc. in the outer part. Very buzzy at the weekend when lots of pop up food stalls and bars cater for the crowds. 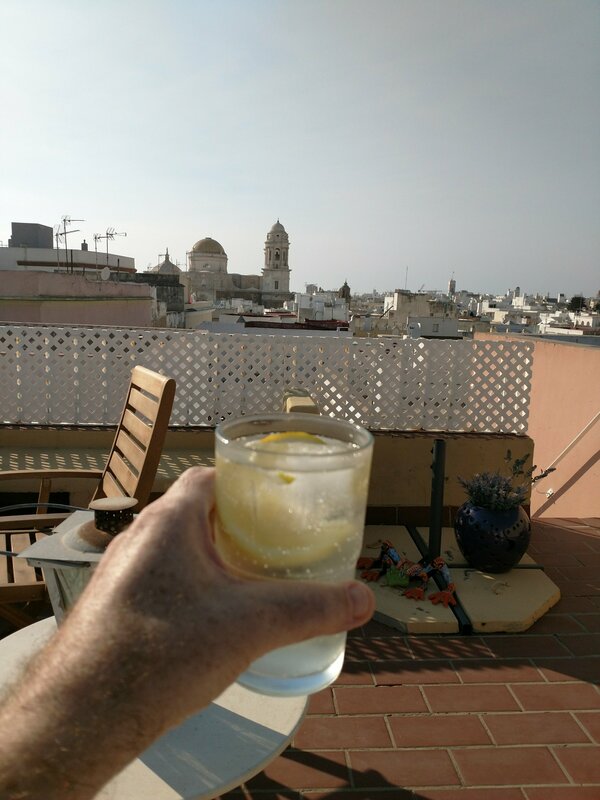 My advice is go to Cádiz – fabulous city where you can do as much or as little as you like (very chilled out place). We combined it with a stay in Sevilla (more on that in a future post) flying in from Gatwick with Eastjet and getting the train (about 1hr 40 – there is a regular Renfe service from Sevilla’s Santa Justa station which is very cheap and punctual). An alternative would be to fly into Jerez (great place to visit) from Stansted (trains go from Jerez airport and city centre to Cádiz- it about half way between Cádiz and Sevilla). Bristol or Cardiff airport – it would be nice to gets flights to Sevilla or Jerez on your rosters, although flying into Malaga (from either) and then getting the train to Cadiz or hiring a car is an option. Enjoy your weekly blog, another interesting review. 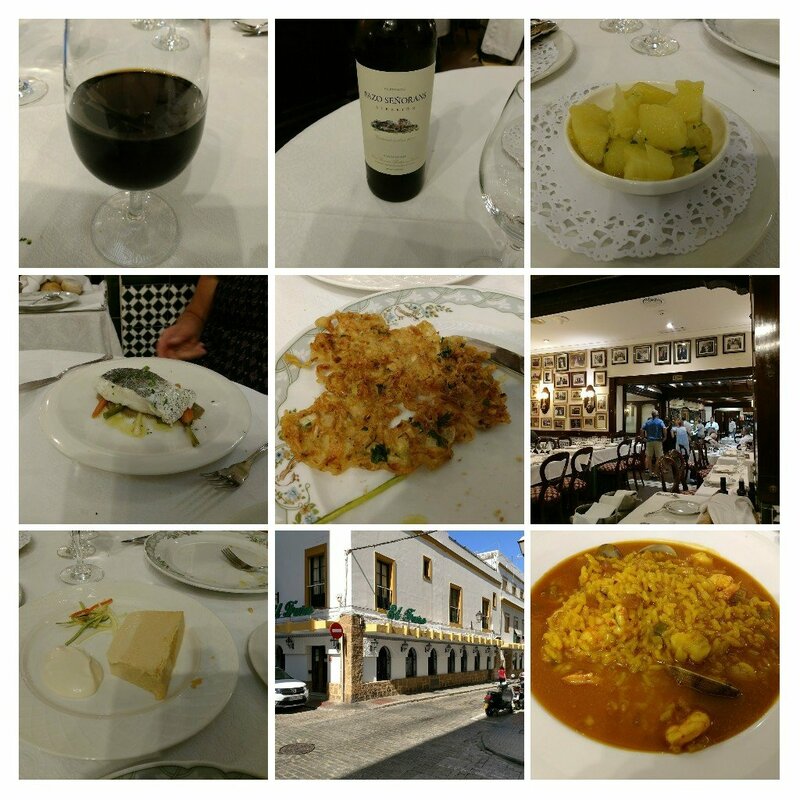 This entry was posted on Oct 22, 2017 by solicitingflavours in Alcoholic drink, Andalucia, Bodegas Urium, Cadiz, Casa Manteca, cheap eats, City break, Drink, Dry white wine, El Faro de Cadiz, Fine dining, Fixed Price Menu, Food, Food and wine products, Frieduras de Flores, Godigo de Barra, Jerez, lamb, manzanilla, muscat, outside UK, Red Wine, restaurant review, review, Sanlucar de Barrameda, seafood, Tasting menu, Tierra de La Cadiz, Tortilla, Uncategorized, vinos de naranja, White wine, Wine, wine mark up, wine pairings.